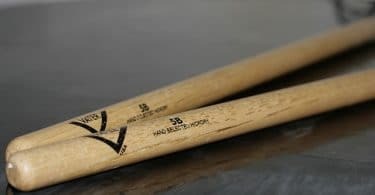 Are you thinking about becoming a drummer but wondering, “Are drums hard to learn?” In this article we will tackle all of the obstacles to overcome. Think for a second… What do Led Zeppelin, The Who, Metallica, and Nirvana all have in common? Aside from multi-platinum albums, influential music, and loyal fan bases, they are all bands with incredible drummers. Yes, these are bands with household guitar player names. Yes, these are bands with influential lead singers. But, at their core, the rhythmic background and driving force behind these bands are their drummers. One could argue that these bands would not nearly have been as successful without the drummers they had. But can anyone become that good? Can anyone learn to play drums? Are drums hard to learn? Like any other instrument, learning to play the drums will take some time and effort on your behalf. 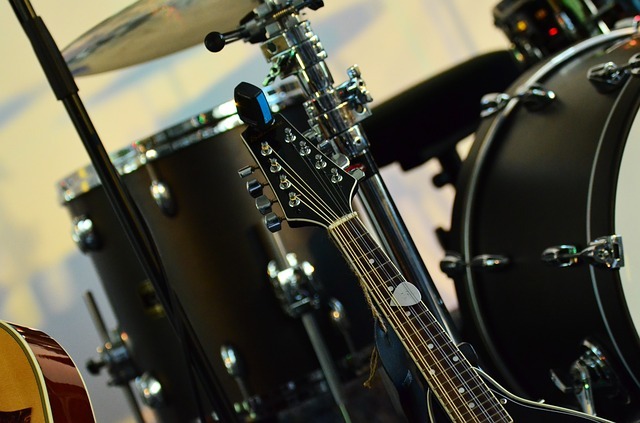 However, while learning to play the drums tends to have a steeper initial learning curve than something like guitar or piano, the long-term payoff is well worth it. In fact, as you can tell from the bands we discussed, it may be indeed well worth it. How hard is it to learn drums? Why drums? Are drums harder to learn than guitar? Are drums harder to learn than piano? Which is more difficult to learn? 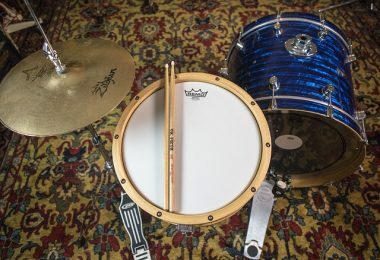 ​Let’s take a look at some of the pros and cons and benefits of learning drums versus learning how to play guitar or learning how to play the piano. Drums are easy. Unlike guitar or piano, two instruments in which you need a general working knowledge of music theory, with drums you don’t need to worry about modes, chords, or scales, which makes learning how to play the instrument a little easier. Sick of never-ending music theory? Switching from guitar to drums might alleviate some of the mixolydian blues. Playing drums can be a great stress reliever. Have a long day at work? Fed up with all the teachers and assignments at your school? There is nothing quite like coming home and pounding away at the drums to alleviate the stress of a long day. It’s carnal. It’s elemental. It’s a rhythmic expulsion of pent-up stress and frustration. One can argue that drumming is great for one’s emotional well-being! 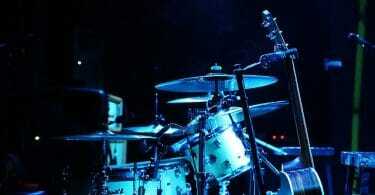 Drums are more physically demanding than guitar or piano. While many would look at this point as a con, when you take into consideration the physical effort it takes to play the drums, you might say that the additional exertion to play the instrument is beneficial from a health standpoint. Think you’re putting on a little weight sitting on your piano bench? Switching from piano to drums might be just the ticket. Quit the gym, play the drums! Drummers are a rare breed. Guitar players are a dime a dozen. You can find a piano player pretty much anywhere. Why be like everyone else? March to the beat of your own drum (pardon the pun). The world needs more drummers! Space. 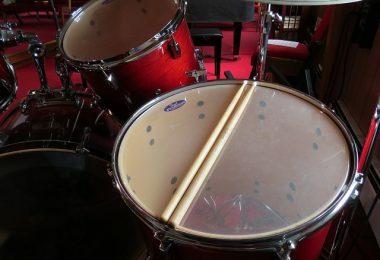 A drum set takes up a lot of space and can be loud, so it might not be viable for everybody. An electronic drum set can take up less space though, and you can play silently through headphones. The Alesis Drums Nitro Mesh Kit is an incredible beginner electronic drum set to consider. Another option is a drum pad. The Evans Realfeel 2-Sided Practice Pad is an excellent (and cheap) option if you want to dip your toes in first. Learning curve. While you can learn three guitar or piano chords in minutes and be able to play hundreds of songs, the initial learning curve for drums can be a bit harder since you have to coordinate multiple limbs doing different things. 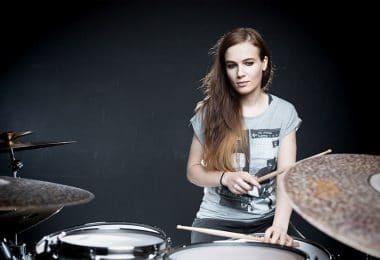 There are however, plenty of resources available about how to become a better drummer quickly. Coordination. 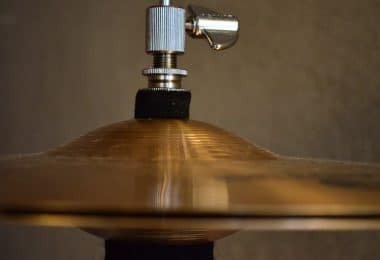 Like we said, at times, it’ll feel like your arms, legs, hands, and feet might be doing completely different things at any given time while playing the drums. This isn’t necessarily a bad thing, as you’ll train your body to do some incredible things insofar as coordination and timing are concerned. Plus, you can stay in shape while playing! As we’ve seen, there are many pros to learning how to play the drums. But how do the drums stack up against other instruments like guitar and piano? Well, like drums, pianos aren’t really the easiest things to bring around with you. Some pianos can weigh upwards of a thousand pounds! Electronic pianos and keyboards require some kind of power source, which again limits their portability. While guitars are generally more mobile instruments, like piano, they might be difficult to play if you have small hands or limited finger strength or dexterity. Electric guitars require a source of amplification in order to produce a sound, meaning you’ll need to purchase quite a few different kinds of gear to actually start making some noise. Why not learn multiple instruments?! You don’t have to choose just one, you can have your cake and eat it too! Try taking a couple of months with each different type of instrument and see how it goes. Check to see if you can rent an instrument for a couple of weeks or months. This will most definitely cut down on your initial instrument investment and also allow you to try out a couple of different types of instruments before you actually decide to buy one. Make sure to give each instrument enough time before you decide to move on. Remember, Rome wasn’t built in a day! Conclusion - Are Drums Hard To Learn? In that sense, no instrument is “easy” to learn. Remember the drummers we talked about at the outset? Those incredible musicians spent their lifetimes mastering their instrument. 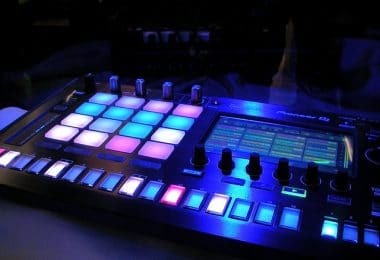 As new techniques, sounds, instruments, hardware, and technology appeared, they learned to incorporate these new things into their playing styles and kits. New drummers would also undoubtedly influence their style as well. So, as you can see, even when you think you’ve got to the level of “master,” the fluidity and change inherent in playing music usually means you’ll always be one step behind knowing “everything” about how to play your chosen instrument. If that’s the case, try everything you can! See what suits you the best, stick with it, and understand that no matter how “good” you get at playing it, there’s always something new to learn. Happy choosing and good luck!